I was completely freaking out yesterday morning, when out shopping with Sienna. I felt something wet flick onto my arm and when I looked down, I saw milk droplets on my bag. When I opened it - the lid of Sienna's 'spill-proof' sipper cup had come undone and there was milk all through my nice red handbag. The reason why I was FREAKING OUT was because my camera was in there also. Enough said. I went straight to Ted's cameras and they were very helpful, towelled it off, checked it out. It wasn't working, but they said to dry it out for awhile and try again. 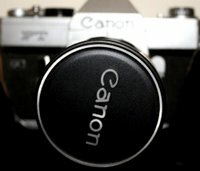 Otherwise it would have to go off to Canon, with that expense as well. To be honest I wasn't as worried about the expense as the prospect of being without camera. Anyhow, this morning it seems to be functioning, but it still feels a bit weird so I'm not sure. The auto-focus was spazzing a bit and it felt like it wasn't working properly, but at least it works. Now I just wait and see how it goes with more drying out time. 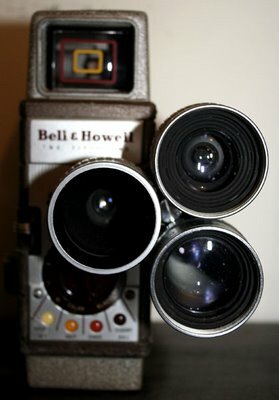 On a more positive note, this pic is of two of the funky vintage cameras I was talking about before.